So simple, so easy, so good and so healthy! Asparagus has been in the headlines recently as one of those super foods jammed packed full of nutrients, vitamins and antioxidants. First, I always snap my asparagus off at the natural breaking point rather than cutting or trimming the ends. This ensures you don't have any "woody" asparagus. Note: Baking or roasting is just as good, and sometimes easier not to burn them. Bake 350° for 15 minutes. Yes, indeed. Grilled asparagus is wonderful. We also like to drizzle it with caramelized garlic and ginger after it has been grilled. We used to bend asparagus and allow it to break at its natural point too. 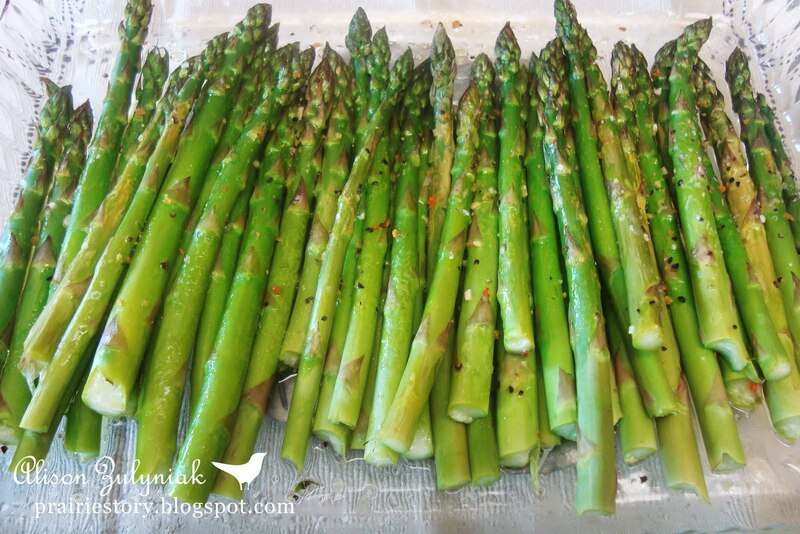 But because of the way the asparagus is pre-trimmed at our vegetable store, there's a lot of waste that way. We learned the following method from watching Laura Calder's TV show "French Cooking at Home": Use a very sharp knife and hit vertically from above, starting from the cut end and moving gradually to the flowerettes to find where the asparagus is no longer tough. (I hope that made sense!) It works fabulously. @ejm mmmm... I'll have to try the carmelized garlic and ginger. Thanks for visiting Prairie Story!